Yes, a "Sacred Secret" so great, so powerful, that when fully understood and comprehended by mankind in general, it will completely revolutionize the way mankind thinks of Genesis 3:15 and what God intended originally, in the Garden of Eden when he uttered this most important prophecy and its outworking for our day and time. Let us read on to see why we say this is so. 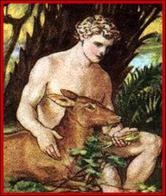 Of course we speak of the "Scapegoat," (which is named such in a number of bibles like the popular King James Version, New International Version, as well as the Septuagint Version of the bible), or as some translations refer to this "goat," yes, as the "living goat" that proves to be the 2nd goat in the scenario of the Day of Atonement procedure. Maybe, you personally remember reading about this, when reading the 16th chapter of Leviticus. If so, you no doubt recall reading about this 2nd "goat," the “live goat” that is surprisingly, "ATONED FOR" before … yes, before it is used by Jehovah God in a special sacrificial sense. Indeed, a careful analysis of this verse, namely Leviticus 16:10, shows us the 2nd goat is actually "ATONED FOR" before it is to be used in a "sacrificial sense" for God. All of this means, this “goat,” could not picture Jesus Christ, in any way shape or form. No, it must picture someone else, besides Jesus Christ. Indeed, the 2nd goat that is ultimately "sent into the wilderness" to "atone" for the nation’s sins, is itself first, "atoned for" before being "presented" to Jehovah for sacrificial use. (Lev. 16:10, 20) Thus, when it is "presented" to Jehovah, it has been cleansed in God's eyes, made holy and prepared BY MEANS OF the 1st goat, which obviously pictures Jesus Christ. Thus, we can say with absolute certainty then, Jesus Christ must picture the 1st sacrificial goat, and to date, an unknown imperfect human should logically picture the 2nd goat...the one we call the Scapegoat of God. 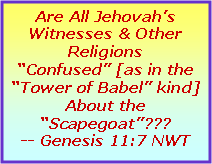 Therefore, based upon the foregoing, it would be the height of foolishness to say or teach Jesus Christ pictures both the 1st goat, and the 2nd goat, as the Watchtower Society, and all other so-called “Christian” religions currently teach world wide. Yes, since we all know, Jesus had no "sins" to be "atoned for" at all. He was a perfect man. No doubt, this is a point that has escaped the notice of many bible scholars earth wide, including the Watchtower Society. -- See John 8:46; Hebrews 7:26. Now what do you think of this small bit of information presented above? 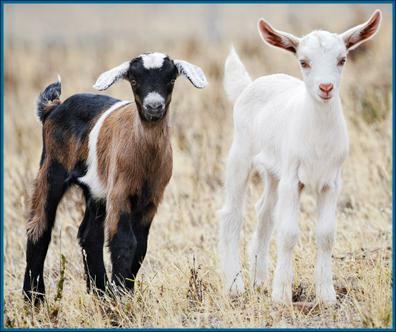 ...If Jesus pictures both “goats” then in this prophetic drama, as all Christian religions believe including the Watchtower Society and all Jehovah’s Witnesses, then why … oh why would there even be a need to TRANSFER … TRANSFER the “sin-atoning merit or a value of life” to the second goat??? In fact, there would be no need … no need to “TRANSFER” anything, since Jesus pictures both goats, isn’t that so??? Incredibly, this foolish statement on the Watchtower Society’s part came about because they had just quoted from their own translation in verse 10 saying the second goat had been “atoned for.” Did you notice this? Which means this “atoning” occurred no doubt by way of God’s applying the “sin-atoning merit” of the “blood” from the first goat, invariably to the second “goat” or “live goat.” That was the God-inspired arrangement. However, when the Watchtower Society chose to speak of something, anything for that matter, yes being “transferred” in this case, it would not make good sense, indeed if the second goat also pictured Jesus Christ. No, it would NOT make good sense. … Almighty God TRANSFERRED the “sin-atoning merit or value” of Jesus’ blood from the first goat [Jesus] … yes, to JESUS, the second goat??? Isn’t that so? 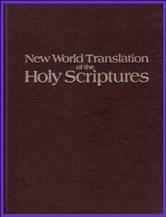 Yes, according to the Watchtower Society’s own words from their printed publications & bible translation, yes Jesus’ blood or the “merit” or “value” of it, was miraculously “transferred” FROM Jesus … oh my, to Jesus, since he, Jesus in addition to picturing the first “goat,” also amazingly pictured the second goat or “live goat” too. “Ridiculous!,” you say. “… Jesus as Almighty God, when praying on earth, was actually PRAYING TO HIMSELF. [Our reaction was … “SAY WHAT”??? … And then they would continue…] Yes, Jesus prayed to himself, accordingly with Jesus also in heaven listening to his actual prayer being pronounced on earth, by Jesus. “Ridiculous” you say, right??? Well, it would be just as ridiculous to say that anything, that’s anything … was “TRANSFERRED” from the first goat to the second, if Jesus himself, pictured both goats. So we see a correspondency in this instance, where the "live bird" is dipped into the "blood" of the first bird, which had been previously "killed" and its blood spilled before God. 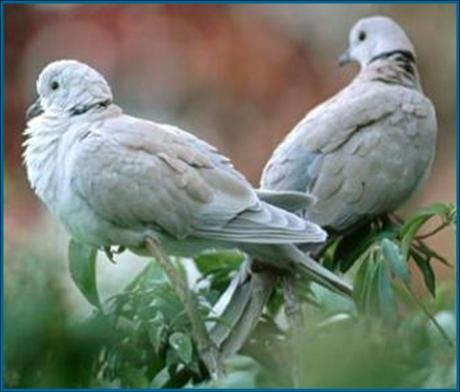 This first "bird" pictures Jesus Christ, willingly shedding his precious blood in a sacrificial sense, in behalf of the 2nd bird, the "living bird," who would in turn be later used in a sacrificial sense also, but much later, in behalf of a future nation of Israel of God's making. A modern-day "Israel" of God's making. Also according to scripture, all of the nations "sins" and "revolts" are next, confessed and "put upon" the head of the scapegoat or E-scapegoat, or "live goat" which is then, to be used in a sacrificial sense for NATIONAL SIN, as a “living” sacrifice. Which means, the 2nd “goat” is now, sent off into the wilderness for sacrificial purposes for the entire nation of Israel. But, first we remember, the “live goat” must be cleansed from sin, yes, by means of the "1st goat," the one that was killed. Then the "live goat" can be viewed by God as a clean sacrifice and is now able to "carry off" the errors and transgressions of the entire nation, to the wilderness for God. (The fact that the “ready man” who released the 2nd goat came back himself “unclean,” proves the “sins” originally placed upon the head of the 2nd goat was NOT atoned for in the camp, as some religionists suggest.) 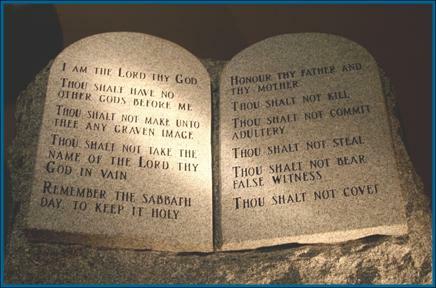 -- See Leviticus 16: 21, 22, 26 NWT. GOD'S "HIDDEN" WISDOM FROM THE BEGINNING -- REVEALED! So then, what was challenged in the Garden of Eden, by the planned calculated wickedness of Satan the Devil to bring about sin and rebellion against Jehovah, was Jehovah's Great Wisdom or Foresight. 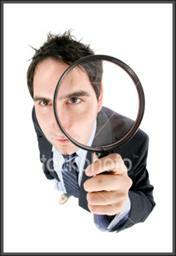 Satan had challenged that established fact before all creation, heavenly or earthly. "Call to me, and I shall answer you and readily tell you great and incomprehensible things that YOU HAVE NOT KNOWN." "So, then as through one trespass the result to men of all sorts was condemnation, likewise also through one act of justification the result to men of all sorts is a declaring of them righteous for life." However let the nation of Jamaica and even the whole earth be notified, that since their (Jehovah's Witnesses) recent fall in apostasy, as revealed by their secret alliance with the United Nations Organization as NGO supporters for ten (10) years (they applied in 1991 up thru 2001), indeed that most holy privilege of being exclusively considered Jehovah God's “Name People” on earth as modern-day Israel, has been STRIPPED FROM THE JEHOVAH’S WITNESSES, and given to the people of Jamaica, those who will obediently bear the righteous "fruits" Jehovah ultimately seeks. (Matthew 21:43; John 4:23; See in-depth article on this topic at: http://www.yorww.com/jamaica.htm also http://www.crossingeuphrates.com/mission.html.) 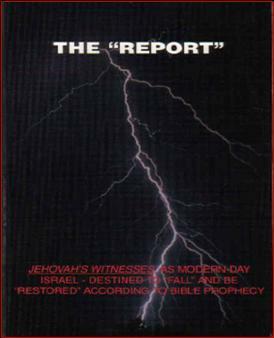 Please note, because of this unique situation, powerful bible prophecy clearly indicates the Jehovah's Witnesses as a people are headed for severe internal problems, problems of such magnitude and proportions, that many will officially leave this religious organization … an event bible prophecy calls the “Birth” of the “Male Child.” -- Please compare Isaiah 66:5-7 with Revelation 12:1-5. -- See in-depth article on this topic at: http://www.yorww.com/rev12.htm. We repeat, amazingly and to the shock of many around the world, bible prophecy actually indicates that awesome, grand privilege of becoming God's “Name People,” would fall upon the nation of Jamaica, numbering some 4 million plus, world wide. 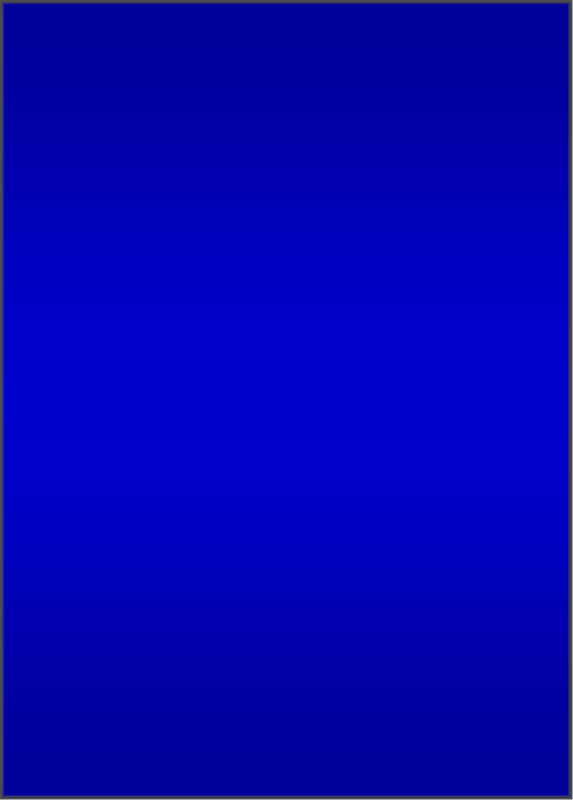 Indeed, the nation and people of Jamaica should now be properly recognized as "a People for God's Name," Modern Day "Israel" even, with the elite number of the 144,000 being selected or chosen from among their number, for a very special purpose in the “last days,” or “end times.” Yes, these very special individuals (144,000) would bear the Name of God "upon their foreheads" as loyal servants of God, singing as if a "New Song" upon Mount Zion, a "Song" that ONLY they themselves could fully "master" or "learn fully," with the special help and assistance of the once "Hidden" or "Concealed" Son of Man, the Modern Day "Servant" of God. 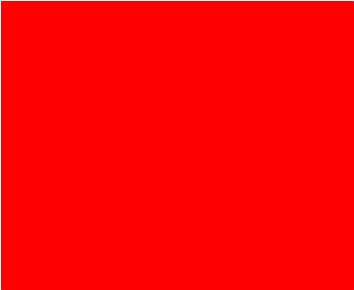 -- See Acts 15:14; Isaiah 49:2; Revelation 14:1-5. The "bond of the covenant", would show the NEED for another Covenantal Arrangement, for the nation of Israel, in God's eyes. And this would be because the nation needed to be "atoned for," by some special means, by means of a "2nd goat" to come on the earthly scene...yes God Almighty foreknew in His infinite wisdom and understanding this would be the case, and therefore made it a PUBLIC RECORD by placing it in the bible itself as a part of the Mosaic Law Procedure itself... in Leviticus 14th and 16th chapters. After Israel should realize their "fall" into apostasy from God, and are severely disciplined by Jehovah God in these "last days," they as a nation, will see the need to "join themselves to Jehovah in an indefinitely lasting covenant," in our modern day times. Can You Count To Two (2)??? "...Some churches discourage the idea of comparing their teachings with what the Bible says..."
One could wonder at this point, aren't Jehovah's Witnesses themselves NOTORIOUS for doing the very same thing? 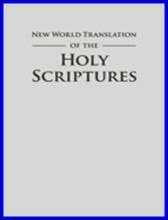 For example, if a Jehovah's Witness, using the bible, begins to question certain "pet" teachings or “hidden” practices of their religion (such as 1914 doctrine, 607 B.C.E. date for Jerusalem's destruction, United Nations NGO 10-year Secret Involvement, etc. ), aren't such ones ultimately “marked," shunned, and even disfellowshiped under the charge of being an APOSTATE ... isn't this so??? 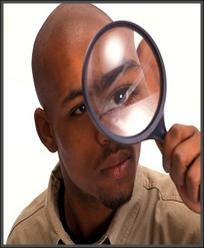 -- For more information on these topics, see the book called The Report Volume I, chapters 6 & 7. "...You could also hold back from scrutinizing your beliefs out of fear that doing so would display a lack of faith. But does it make sense that God would be displeased with you for looking into the Bible, his message to mankind, to understand what he asks of you? On the contrary, his Word encourages you to examine the Scriptures personally, saying: "Prove to yourselves the good and acceptable and perfect will of God. "-Romans 12:2." -- See the October 1st, 2011 Watchtower magazine page 9, paragraph 3. After reading the above, this writer wonders if Jehovah's Witnesses themselves, are willing to do the same for their own religious beliefs... Hmmmmmmmmm. What do you think? Well, let's see. Please examine the following information below. 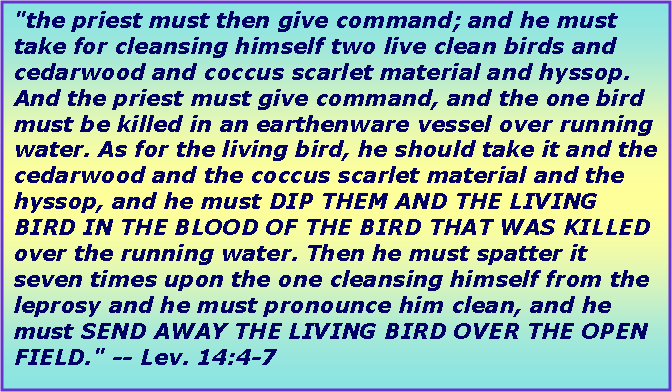 Why in Leviticus 14:6, 51, is the “living bird” DIPPED IN THE BLOOD of the first [killed] bird, and what lesson do we think God has been trying to teach us with this illustration / procedure for over 3,600 years? -- See Leviticus 14:6, 51. “As the apostle Paul explained, by Jesus’ offering of his own perfect human life as a sacrifice for the sins of mankind, he accomplished far more than had been achieved by ‘the blood of bulls and of goats.’ (Heb. 10:4, 11, 12) He thus served as “the scapegoat,” being the ‘carrier of our sicknesses,’ the one “pierced for our transgression.” (Isa. 53:4, Mt 8:17; 1 Pe 2:24) He ‘carried away’ the sins of all who exercise faith in the value of his sacrifice. He demonstrated the provision of God to take sinfulness into complete oblivion. 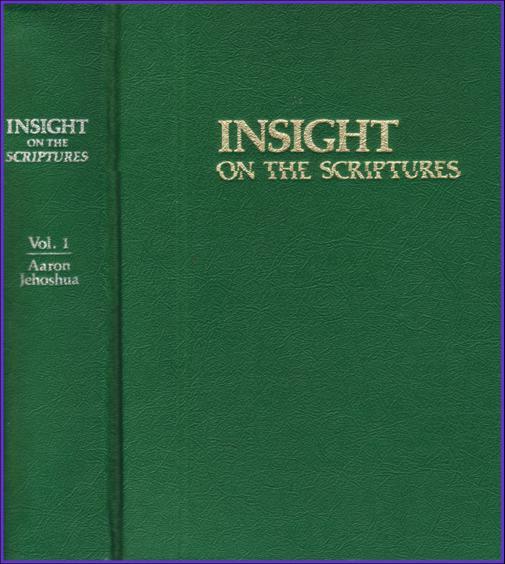 In these ways the goat “for Azazel” [Az·a’zel] pictures the sacrifice of Jesus Christ.” -- See Insight On The Scriptures, Volume 1, page 226 paragraph 3. So we can see, the Watchtower Society does indeed believe the 2nd goat does picture Jesus Christ, along with the 1st goat too. Jesus pictures BOTH “goats” according to the Watchtower Society and Jehovah’s Witnesses. However we note something very interesting about this situation, namely, the "live goat", after being cleansed of sin, is then used in a sacrificial sense itself to "atone for" the nation's sins -- that’s AFTER its initial cleansing before God. Now, what do you think of that fact?? ?